hakeem94 and Invisible Fan like this. Pelicans made some odd choices with only trading Mirotic no? Kuzma is in a league of his own in terms of talent as a young player. Those others are not close. BallSoHarden and hakeem94 like this. PHILADELPHIA -- Los Angeles Lakers president Magic Johnson said the New Orleans Pelicans operated in bad faith during negotiations with his team over a deal for superstar Anthony Davis. However, he isn't dwelling on the trade deadline failure, and he wants his players to shift their focus forward as well. "We knew that basically at the end of the day what happened, happened," Johnson said before the Lakers played the Philadelphia 76ers on Sunday. "And we knew that when we first started in terms of what happened. But hey, it is what it is." Johnson was asked if the New Orleans front office -- run by general manager Dell Demps and executive vice president Mickey Loomis -- acted in good faith from the time Davis' trade request became public until the deadline passed without a deal. But Johnson pushed back against the notion that the public nature of the negotiations was unfair to L.A.'s young core which heard their names mentioned as trade chips on a near daily basis. "Quit making this about thinking these guys are babies because that's what you're treating them like," Johnson said. "They're professionals. All of them. And this is how this league works. They know it, I know it, that's how it goes. "So we've got to move forward and we are moving forward. They played outstanding against Boston, give them credit. And we want to play well today and continue on. This is a part of the league. You've got a good side of the business that we get paid to be professional basketball players and there's deals like this." Johnson also rejected a characterization that the negotiations were any different than the way the rest of the league conducts their business. "All deals are... A lot of them are made in public," he said. "We didn't make it in public, but that's part of it. That's what happens, man. We've got big boys here and they bounce back. They're fine." When asked if the way things went with New Orleans could have a hangover effect on his franchise this offseason, Johnson remained steadfast in his vision for returning the Lakers to championship form. "That's not going to change our plans this summer," Johnson said. "It's a great (free agency) class and we just want to get one of them." "We were on the phones early on," Johnson said, admitting the Lakers wanted to add shooting to their lineup for quite some time. "Nobody was going to make a move until the last week. And we were locked into Reggie for a long time. Had some great talks with Detroit. And then finally it became a deal. Mike was really last second when we didn't know that Philly was going to make that move (acquiring Tobias Harris from the Clippers). When they made that move and we looked up and said, 'Man, a stretch 4-5 could really help us out.' And we feel good about the trade." Johnson joined the team in Philadelphia on Sunday after attending a reunion with the 1979 Michigan State NCAA men's basketball championship team, celebrating the 40th anniversary of their win in East Lansing, Mich. on Saturday. Johnson used the trip to reconnect with his team and reemphasize their directive for now until April: help the Lakers qualify for the postseason for the first time since 2013. "I don't want them focused on this other stuff," he said. "What happened, whose name was mentioned, all that. That's over with. That was Thursday. This is now. Everybody got to buckle up and we've got to move forward." With the high stakes nature of playing in the NBA, let alone playing for a team like the Lakers which has always defined itself by its championship standard, Johnson said that trade talks will only continue to surround his team. "Listen, we get paid to do a job," Johnson said. "And we're all professionals. I've been in this league for 40 years. A lot of players got traded on Thursday and Wednesday. Guess what's going to happen next year? A lot of players are going to get traded. A lot of players will stay home. And I talked to our guys, they're in a good place. That's all that matters. We're heading towards, hopefully, getting into the playoffs. And so, that's a part of it. A part of NFL, a part of NHL, a part of Major League Baseball, a part of the NBA." Johnson was asked about Sixers second-year star Ben Simmons, who as a 6-foot-10 point guard, has drawn comparisons to the 6-foot-9 Johnson, who won five rings playing point guard for the Lakers. "(Simmons) reached out to me, not to me directly, to the Lakers to find out if we can get together this summer," Johnson said. "I said, 'Hey you got to clear it with the league,' and if everybody -- the Sixers sign off, we sign off, the league sign off -- fine, I will do that. But if everybody doesn't sign off then we can't get together. "But I love his game, I love his vision, I love also too, he's very, in terms of basketball IQ, very high basketball IQ." Vivi, malakas and KingCheetah like this. "We knew that basically at the end of the day what happened, happened,"
"And we knew that when we first started in terms of what happened." "But hey, it is what it is." BigMaloe, Hakeemtheking, BallSoHarden and 2 others like this. Lakers playing the victim sounds fitting. The persecution is real people! 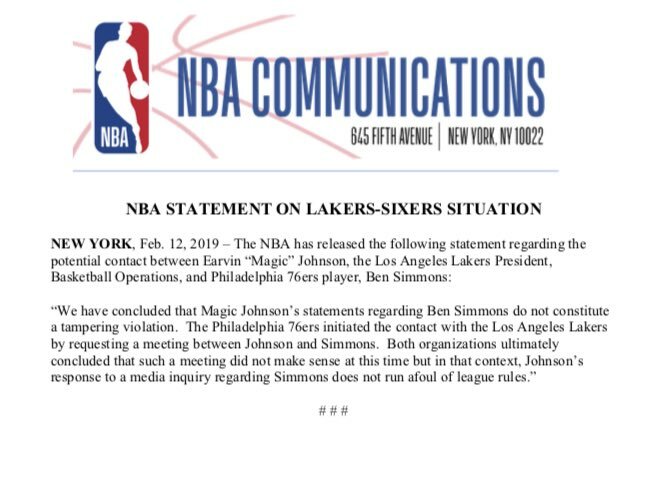 Those Simmons comments... does Magic realize that's even more tampering...? Richie_Rich, plates300, malakas and 1 other person like this. BallSoHarden, fckbandwagons and B-Bob like this. Would this pass concussion protocol? AroundTheWorld and hakeem94 like this. Elton Brand tells ESPN: "No issue. I have a great relationship with Ben and Rich (Paul) and we expect him to be a Sixer for a long time. He has taken interest in chatting with some of the game's all-time greats and we're supportive. I had brief dialogue with Rob Pelinka who I've known for a long time, but nothing is planned. Our collective focus is on making a postseason push. Again, we're not sweating this, end of story." If the League and Adam Silver turn a blind eye on this issue, again, then they're as much of a joke as Roger Goodell and the NFL. Unfortunately I think they will do so and slap a $200k (e.g. meaningless) fine on this and call it a day. I really wish the league would restrict these particular FA's from joining the Fakers … its quite obvious there is tampering going on and I think that's a fitting penalty - those players ineligible to sign with the offending team via FA. No tampering. Please move along. Nothing to see here. the NBA denied that they threatened the Pelicans with a 100k fine per game if they didn't play Davis. Well then in that case, NOP should send him home. Let's see what Silver will do. RasaqBoi and robbie380 like this. the league should move the lakers to vancouver as punishment and make the clippers the team in la. AroundTheWorld, malakas, pippendagimp and 1 other person like this.